T-3 tablets (Liothyronine Sodium) are a treatment for patients with hypothyroidism. This is a condition where the body is unable to produce enough thyroid hormone on its own. Liothyronine is a synthetic version of thyronine. 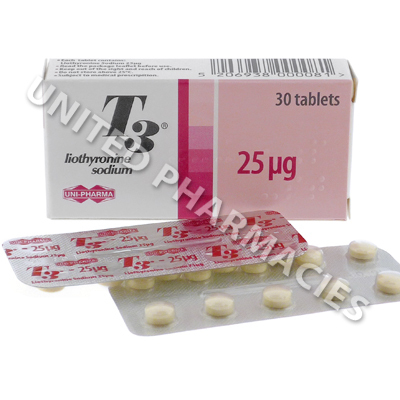 T-3 tablets (Liothyronine Sodium) are a treatment for patients with hypothyroidism. This is a condition where the body is unable to produce enough thyroid hormone on its own. Liothyronine is a synthetic version of thyronine. Thyronine is important for regulation of energy and metabolism in the body, as well as for cell growth. T-3 tablets (Liothyronine Sodium) can also be prescribed to patients with goiters (an oversized thyroid gland resulting from endocrine disorder). Each individual will be prescribed a different dosage. Usually you will start on a low dosage and increase this over time as your body adjusts to the new medicine. Take Liothyronine Sodium once daily, usually in the morning before breakfast. Some medicines can have unfavorable interactions with Liothyronine including anticoagulants, anticonvulsants, antidiabetics, barbiturates, cardiac glycosides, estrogens, oral contraceptives, and tricyclic antidepressants. Before starting treatment, make sure your doctor is aware of all medicines you are taking, especially if they fall into any of the categories listed above. Patients with untreated adrenal cortical deficiency or with untreated thyrotoxicosis cannot take T-3 (Liothyronine Sodium). Liothyronine is classified in pregnancy category A meaning there are no known risks during pregnancy or while breast-feeding.